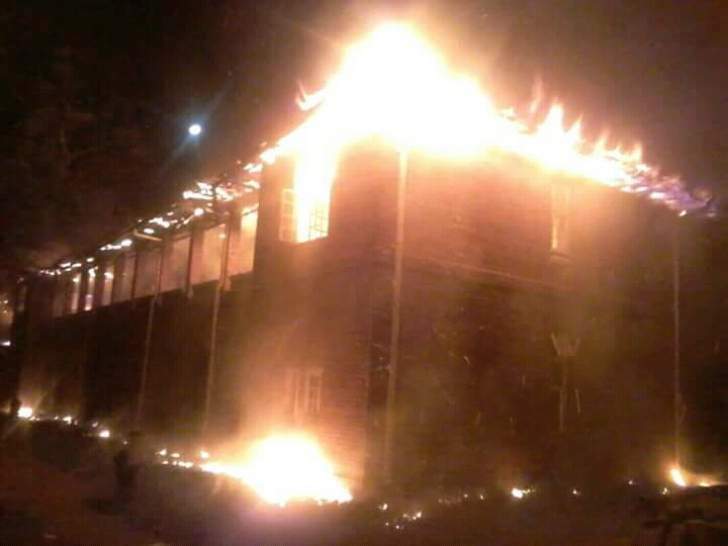 A TOTAL of 120-A Level pupils at Plumtree High School could find themselves without shelter when schools open in three weeks following a fire that razed their hostel on Tuesday. The Government has dispatched a team of evaluators to assess and quantify the damage to the monumental double storey Lloyd Hostel. School authorities suspect arson in the inferno that destroyed the pride of the once prestigious high school. The authorities estimate the damage to run into millions of dollars and Government has dispatched the team to come up with a definite figure. A source at the school said accommodation problems await Plumtree High School as they have no alternative accommodation to house the returning pupils. "The hostel was a double storey building which accommodated 120 boys all of whom have been rendered shelterless on their return. Other hostels are fully occupied so we are in a dilemma," said the source. The source prayed that officials from the Ministry of Local Government, Public Works and National Housing do not condemn the building as unsafe for habitation so that they mobilise resources and refurbish it. "If they don't condemn it the better as we can mobilise resources and restore it. However, if it's condemned then it means we have to demolish it. That will be a big loss. We are hoping that it won't go that away and we appeal to well wishers, NGOs and stakeholders for assistance in our time of need," said the source. Matabeleland South Head of Public Works, Engineer Sijabuliso Ncube yesterday confirmed having dispatched a team to the learning institution on Thursday. "I am not in office. I'm in Mutare. However, I have dispatched a team of evaluators to the school. They are there to assess the damage to the infrastructure and quantify it in terms of monetary figures. After they have finished they will send the results to my office and that's when I will know the total cost of the damage," said Mr Ncube. The fire started shortly after 9PM on Tuesday night and was discovered by a History teacher, identified as Mr Ndlovu who was housed in an apartment on the ground floor of Lloyd House. Plumtree fire fighters who arrived soon after the fire broke out failed to extinguish it after their fire tender malfunctioned and failed to release water. They had to send an SOS to Bulawayo Fire Brigade, which arrived two hours later and foun d the hostel already a shell. They battled the smouldering flames for three hours and finally won the battle at around 3AM on Wednesday.